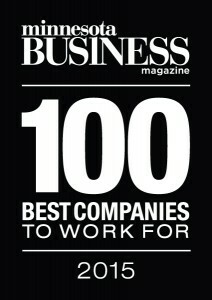 We’ve been honored yet again to be recognized as one of the Top 100 Best Companies to Work For by Minnesota Business Magazine. We couldn’t be more honored! Yes, popping bottles of wine at the end of the day is part of it. Yes, gathering for outstanding meals is part of it. But a larger aspect is the evolution of a culture, and culture can’t be pre-planned and mapped out on a blueprint. It’s the personalities of all that are involved that make it happen. A collective whole. A company that works well together elevates everybody’s performance to achieve more than they thought possible as individuals. The goal is to have a blast while doing it. That’s what it’s all about. It’s this collective whole that we love and embrace at The Wine Company. Minnesota Business Magazine was kind enough to send out a videographer to capture our office in action. Take a look at their great video, which won the first prize in the video contest during the awards ceremony!